Holiday Inn Chicago Downtown – West Harrison St.
3Back’s Certified Scrum Master training provides the tools and information necessary to help you get started with Scrum at your own company. Through a combination of robust simulations, hands-on experience and high-quality instruction, students will learn the fundamentals of Scrum and how to facilitate, coach and lead an agile project. We’ll cover your Scrum Alliance membership dues for the first 2 years, as well as your exam fee. 3Back students have a better than 99% pass rate on their first attempt at the Scrum Alliance Certified ScrumMaster exam. Your exam fee is included with your course registration, so you’ll be set to get certified right after class. As a CSM participant, you will receive 3Back’s exclusive Scrum Study Guide (a $49.95 value), including 2 practice tests, to help prepare for the exam after you leave the classroom. Since 3Back is a PMI Category A (previously referred to as Category 3) Registered Education Provider, you don’t have to worry about the security of your PDUs, even if you get audited! As a 3Back public course participant, you’ll receive free lifetime access* to the Scrum planning and implementation tool Get To Done® (a value of $60 per year). *Access expires if account remains inactive for 12 consecutive months. 3Back trainers don’t just teach Scrum; they have a combined 46 years of working on and with Scrum teams. They are authors of the Exploring Scrum: The Fundamentals, the Scrum Study Guide and the agile tool Get To Done®, as well as world-renowned conference speakers. Even with heightened engagement, most of us only retain a fraction of what we learn. That’s why 3Back provides you with the option to retake our class. Whether you’re looking for another trainer’s perspective or just want to refresh your knowledge, you can do so within six months at no cost. More details at can be found in our policies. 3Back’s CSM course is not your usual classroom training. Our trainers use cutting edge adult learning practices, which not only make the class enjoyable, but are proven to increase retention and understanding. Course was paced well. Material excellent. Instructor very knowledgeable. I definitely feel more comfortable in regards to the process of Scrum. Dan is very much a Subject Matter Expert and it shows. I enjoyed the way Dan was able to break things down into real world examples. This course was very insightful in that it helped me realize the Scrum process used at my company has flaws. It also helped me pin point these flaws. We were able to cover a lot of material in a short period of time. Dan made the course interactive which helped in the learning. I genuinely feel as though I learned how Scrum Mastering should be done and feel like I can explain it. Interesting material. Learned about what we do is not ideal and how to Scale. Will try to implement for my clients. Excellent. Never did story mapping at the Product Champion level and it was very cool. Learned about the various PO [Product Owner] roles which helped me understand the various hats as well as skills that I might need to develop to grow. Great courses. Lots of info. Have learned actual meaning of some of the terminology, will be able to translate this to better use of my Teams. What are Scrum and Agile? Enrolling in 3Back’s Certified ScrumMaster training is the first step toward achieving your own ScrumMaster certification from the world’s largest, oldest and most recognized Scrum certification organization — the Scrum Alliance. 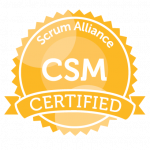 Successful completion of a Scrum Alliance approved CSM course is required to take the certification exam. Upon successful completion of your Certified ScrumMaster training class, your credentials will be sent to the Scrum Alliance and they will contact you directly with instructions on taking your exam. The initial cost of your exam plus a 2-year membership to the Scrum Alliance is included in your 3Back course registration, so there’s no need to worry about hidden costs or surprise fees later on. We know that test anxiety is common so we do everything we can to help you prepare. In addition to the knowledge obtained in class, you will receive a free Scrum Study Guide with two practice exams. And, if you need us, our entire staff (including your trainer) is only a click or call away, so if you need clarification or review, just drop us a line. Following your Certified Scrum Master training course, you’ll have 90 days to complete the non-proctored online exam. The exam consists of 50 questions selected randomly from a pool. A passing score requires a minimum of 37 correct answers. Although 3Back students have a pass rate of over 99%, in the event that you should need to retake the exam, a second attempt is included at no cost. Additional attempts are $25 each. We have done our best to provide the most up to date information. However, we suggest checking the Scrum Alliance directly for additional details or confirmation of the above. 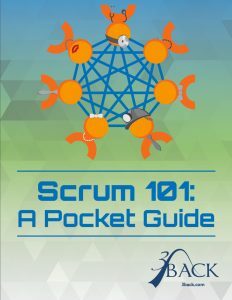 This book takes a deep, exploratory, look into the Scrum framework, and offers advice about how to think about it, and how to use it. Some of this advice is philosophical, some is pragmatic, some is practical, and some of it is controversial. This book is not an introductory text. Get To Done® is both online software and cards on walls. We have worked hard to bring this unique tool to you so that you have full support for writing and managing complex backlogs. Stop regressing! Getting Scrum implemented right is hard, your software tool needs to support the right behaviors or groups often regress. Your registration includes, free of charge, lifetime access* to Get To Done® (a value of $60 per year). *Access expires if account remains inactive for 12 consecutive months. Scrum Dictionary exists for one simple reason. Words matter. In the world of Agile frameworks, words matter event more. Scrum Dictionary removes the lexicon noise and delivers a clear, concise definition of Agile terms, complete with examples and related terminology, in a format that's as user-friendly as they come. So you want to learn Scrum. But is training really worth it? What can training give you that reading a few books can’t? Transforming your team or organization to a new methodology is a big undertaking. Organized training will give you the kickstart you need and save you valuable time otherwise wasted on costly trial and error. Studies show that when learners “do and say,” they experience an increase of knowledge retention up to 80% over reading alone. Books and blogs are good knowledge resources. Skill, however, is acquired by doing. There is simply no replacement for the skill building that occurs with hands-on activities and real-life simulations. The most popular use of Scrum is for software development in a wide variety of industries, including financial services, insurance, education, information technology, government programs and supply chain management. But Scrum goes beyond software development! We’ve known organizations and individuals who have used Scrum for graphic design, wedding planning, data warehousing, consulting, classroom projects, household management, auto salvage yards and much more. Scrum is appropriate for almost any complex project with rapidly changing or emergent requirements, regardless of the industry.